What reporting tools can I use with project data? The sections below provide more information about reporting options for project data. 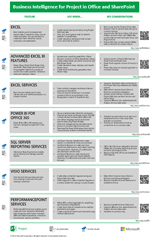 To download a poster that summarizes all of these tools, see Business intelligence for Project in Office and SharePoint. Project Overview Dashboard, which provides high-level information about projects, including start and finish dates, risks, issues, and tasks. This dashboard was created by using Power View in Microsoft Excel 2013. You must have Silverlight installed on your computer in order to view the workbook. Project Overview, which provides high-level information about projects, such as percent complete, number of assignments, and number of tasks. This report was created by using Power Pivot. Resource Overview, which provides high-level information about projects, including number of hours worked and number of tasks by resource. This report was created by using Power Pivot. If you're using Project Web App for Project Server 2013 (on premises), even more sample reports are available. To learn more about the sample reports, see Sample reports in Project Online. Use AutoFill and Flash Fill, which enables you to format a column of data a particular way without having to use a complex formula. For example, if you have a column that contains a list of dates and times, and you want a column that contains just dates, you can use Flash Fill to make that change. See Creating charts from start to finish. If you're using Project Online (in the cloud), see BI capabilities in Excel and Office 365. If you're using Project Server (on premises), see Business intelligence in Excel and Excel Services (SharePoint Server 2013). If you're using Project 2013, you have a wide variety of reports available on the Report tab. See Pick the right report in Project 2013 for an overview of the different reports that are available. See Create a project report to learn how to create reports in Project 2013. Reporting Services is a powerful reporting platform that is available with SQL Server. Some customers prefer to use Reporting Services to create and share reports. Typically, IT administrators and developers create Reporting Services reports, and then share those reports using SharePoint or a Reporting Services report server. See SQL Server Reporting Services tools. PerformancePoint Services in SharePoint Server 2013 is a great tool for creating power key performance indicators (KPIs), scorecards, reports, and dashboards. Ideal for (on premises) data stored in SQL Server Analysis Services, PerformancePoint Services enables you to create interactive, reusable dashboard items. See TechNet Article: Create dashboards (PerformancePoint Services in SharePoint Server 2013). You can use Visio to create a data-connected diagram, and then share it with others by using Visio Services in SharePoint. See A beginner's guide to Visio and TechNet Article: Overview of Visio Services in SharePoint Server 2013.